Small Business Advocate Poll: How will the economy influence your vote for president?
. Tags: 2012 Presidential Election, economy, Jim Blasingame, Poll, Poll Commentary, Poll Question, Poll Response, Presidential Election. How much will the condition of the economy influence your vote for president in November? 15% - The condition of the economy will influence my vote for president. 12% - Regardless of how the economy is doing, I will vote for Obama. 73% - Regardless of how the economy is doing, I will vote for the Republican ticket. During the 1992 presidential election, between incumbent George H. W. Bush and the challenger, Bill Clinton, a tiny little recession had occurred that was just big enough to be a factor in that contest. One of Clinton’s advisors, James Carville, coined a phrase that arguably helped his candidate win that year, “It’s the economy, stupid.” And 20 years and five presidential election cycles later, the term endures as the maxim to introduce economic issues into any political debate. Even though America is still dealing with vestiges of the The Great Recession, the U.S. economy does seem to be exhibiting recovery signs. 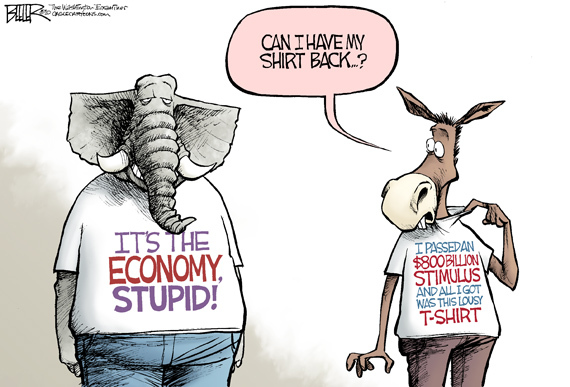 Still, enough economic challenges remain in what I’ve termed the “Not-so-great Recovery,” for Republicans to be able to turn the tables on Democrats and co-opt “It’s the economy, stupid,” as their 2012 campaign slogan. Former Chief Economist of National City Bank, Richard DeKaser is President of Woodley Park Research, where he oversees macroeconomic forecasting, real time economic analysis, and housing valuation research. Bill Brandt is President and Chief Executive Officer of Development Specialists, Inc., a firm specializing in the provision of management, consulting and turnaround assistance to troubled or reorganizing concerns. Click on the links below and listen to what these smart men have to say. You may be surprised! I definitely need to forward this to my boss we were just talking about this last week!